Sting uses yoga to stay fit. 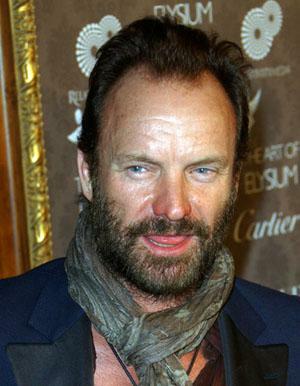 Sting, the popular solo artist and front man for the band The Police, has received a lot of press for his interest in Tantra yoga. However, he and his wife, Trudie Styler, are avid students of Jivamukti and Ashtanga yoga styles. Sting admits in various interviews that he always believed good physical fitness was important to maintain because of the demands placed on a touring musician. He jogged and did aerobics, and was interested in more challenging workouts. "I thought yoga practitioners sat cross-legged on the floor and contemplated their navels," he's been quoted as saying. In the late 1980s, bandmates introduced Sting to Danny Paradise, a musician and Ashtanga yoga instructor. Sting recalls that although he was fit, he couldn't do even half of the postures Paradise showed him. From that point on, Sting thought yoga was intriguing, and started studying it with Paradise as his mentor. Sting was in his late 30s at this time. He has said in interviews that he wishes he started doing yoga sooner, but acknowledges that he probably wouldn't have been as accepting of it when he was younger. In the years since, Sting has evolved into an active participant and promoter of yoga. In one interview he said, "If anything, it's reversing my aging process. I can now do things with my body that I wouldn't even have thought possible when I was an athletic teenager." When he's touring with his band, the entire group performs yoga before the show, which Sting believes "increases our cohesion." Sting admits now that his daily practice is an integral part of his wellbeing, and approaches the spiritual aspects of yoga with respect and contemplation, especially as he gets older. After Sting had his first Ashtanga yoga session with Paradise, he immediately wanted his wife, Trudie Styler, to try it with him. In the years since, they have advanced their practices considerably, both as individuals and as a couple. Sting remains close to Paradise and often takes classes with him. Sting and Styler are also devotees of Jivamukti yoga, a practice co-founded by Sharon Gannon and David Life. Jivamukti means "liberation while living." The Sanskrit term is used to describe enlightenment. Certified instructors concentrate each session around a theme, supported not only by asanas, but also Sanskrit readings and chanting, music, core philosophy, and breathing exercises. Sting and Styler are good friends with Gannon and Life, and offer their support to the Jivamukti centers in various ways. There are Jivamukti centers in New York City, Charleston, South Carolina, Toronto, London, Berlin, and Munich, and you can review their list of certified teachers. Read this feature in White Lotus about Sting's perspective on yoga and life. In 2009, Trudie Styler released the Warrior Yoga DVD set, featuring music from Sting's classical album, Songs from the Labyrinth. With the assistance of fitness instructor James D'Silva, Styler crafted a yoga routine that includes cardio, ballet, and strength training. Pick up a copy of the Yoga Revolution CD, featuring music from Sting and a host of other popular artists. Proceeds help support fitness and yoga programs for youth.